Don Cohen has been teaching math for 56 years. He has taught in Junior HS, college, worked with Dr. Robert B. Davis for about 15 years with The Madison Project training teachers, and developed student lessons on PLATO, a computer-based program at the U of Illinois. He co-founded and taught in The Math Program, a private program, tutoring children since 1976. Some exciting things that have happened since then: He and his partner, Jerry Glynn, have small groups of students after school; this gave them time to work together on mathematics, on how kids learn, and on sharing with the world some things they enjoy doing. 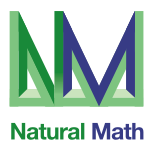 Jerry has written two books, on Derive and Mathematica. In 1988, Don wrote and published his book "Calculus By and For Young People (ages 7, yes 7 and up)" which was reviewed in the Dec.'88 issue of Scientific American, among others, and then made 2 videotapes, a book "Calculus By and For Young People-Worksheets", and a book "Changing Shapes with Matrices",and "A Map to Calculus"-- all under the name of Don Cohen-The Mathman. The Japanese translation of his book "Calculus By and For Young People (ages 7, yes 7 and up)" was published by Kodansha Ltd., in August 1998; they sold over 30,000 copies in 10 years! Don's book "Calculus By and For Young People-Worksheets" was put on a CD-ROM in Japanese and English, published by Mr. Hiroshi Takimoto. Don's book "Changing Shapes With Matrices" was also published in Japanese by Kodansha, Ltd. All Don's work is now on a 2-CD set. 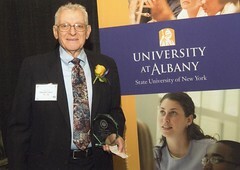 In 2008 Don was the recipient of The Excellence in Education Award given by the Alumni Association of the SUNY at Albany (see the picture above). Besides his local students, he has taught students by email and IM around the world. He has had 3 children and one Juku teacher who came from Japan, and many within the US, to work with him. Don's wife Marilyn, of ~58 years, continues to be his biggest supporter and only love. They have 4 fine sons, 8 wonderful grandchildren and 3 terrific greatgrandchildren. Don feels very fortunate to have worked with and affected so many youngsters, - and their children, in a very positive, successful, and enjoyable way. Don's keys: Look for patterns, Learn to learn, Visualization (graph and picture everything) "Learning, Living and Loving mathematics.."- the core of Don's teaching and books, observed by Seth Nielsen. Graphing (Cartesian & complex plane, polar, parametric and 3D) and its interrelation to algebra, arithmetic, functions, empirically determined functions, iteration, geometry, geometric transformations with matrices, infinite series, infinite sequences, complex numbers, derivatives, integrals, math in nature, math in science, use of applets, and hands-on, as done by Don with students ages 4- to 73- using Don's A Map to Calculus, as the base. Don expects to learn something and get enjoyment from, the questions and graphs the participants will make, as he does with children. He will show how the Map can be used to help students, parents, teachers and teachers of teachers. P articipants will also see how a 4 yo walked to the points for x+y=5 on his kitchen floor, to seeing the points of inflection of a function by graphing the function and the 1st and 2nd derivatives on one graph, and get the area under curves to get the integral by Don's plotting points on a calculator.